The idea behind the Blog Hop is for creative bloggers to write a post based around a few questions. Their answers offer an insight into their creative thoughts and processes. The blog ‘baton’ is then passed on to a another artisan and so the trip around the globe gathers pace. I was asked by Tracy of Cinnamon Jewellery to continue the hop. Tracy is a fellow jewellery maker who inspires me with her beautiful copper, silver and colourful enamel creations. Her blog is always generously informative about her processes and one of my favourite ones to follow. This journey I am currently on, is it for ‘business or pleasure’?! The answer to this has to be for pleasure. Of course, I want to be a highly successful jewellery designer who has customers clambering for my next line of jewellery… but I have to be realistic, don’t I! I never set out to make jewellery. By qualifications I am a primary teacher, but I am taking time out from that to pursue my ‘jewellery making’. I love being creative. It makes me really happy to follow an idea through to a final piece of jewellery. It’s such a satisfying process and then even more so if someone else likes it enough to buy it and wear it. I get a real kick out of seeing someone wearing my jewellery. My creating process nearly always starts with a shape. I see ‘shapes’ everywhere… out the car window, in my garden, within the centre of a flower, in a pattern of a dress someone is wearing, a section of a wrought iron gate… Shapes that appeal to me are linear with negative space. That sounds very ‘arty’ when I write that, but I think I know what I mean! What I am trying to say is that the lines of a shape create another shape within them which is equally interesting to me. Sometimes I have to draw shapes I like down on paper as soon as possible so I don’t forget them. Then later, when I have time, I will ponder over them and decide how I could turn them into a jewellery design. Other times I feel like the shapes have been mulling around in my brain for a while and it’s only when I rest that they take form. When I lie in bed trying to get to sleep, instead of counting sheep, I imagine shapes and swirls. I always have a notebook by my bed for those moments. The next morning my husband will find me at my workbench, wire and pliers in hand, trying out an idea that came to me the night before. Actually at the moment, I am currently having a ‘break from the norm’! 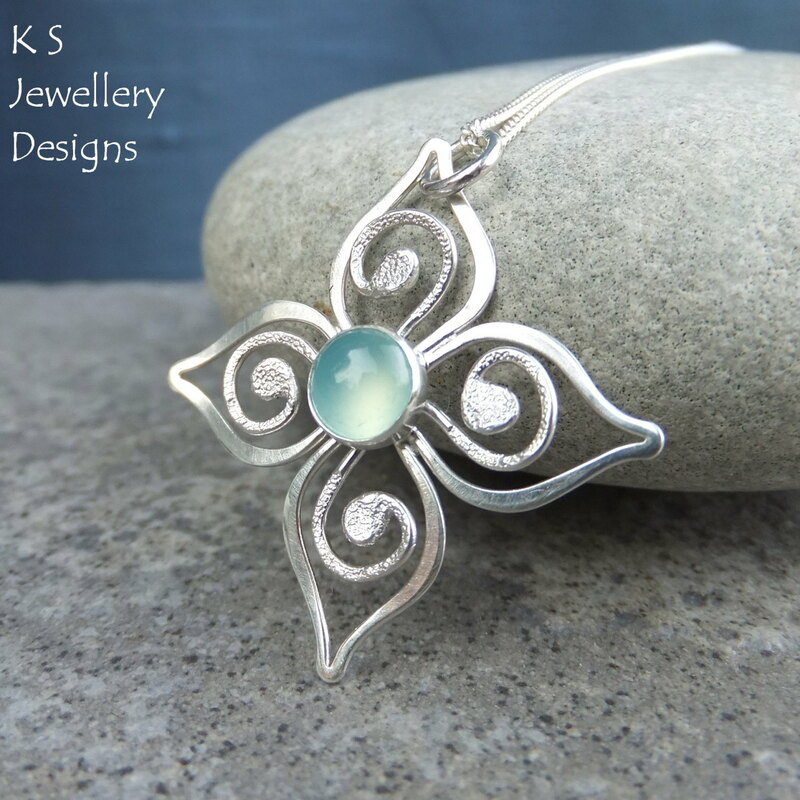 My usual jewellery designs are often based on my interpretation of natural forms, mainly flowers and leaves. However, a couple of days ago I was doodling spirals on my shopping list (!) and adding other shapes. When I looked at what I had drawn, I realised the doodles had a geometric and Aztec feel to them. From that initial design, I made a pair of earrings. The new challenge in making these earrings was whether I could solder a spiral together and fill the gaps with solder. Would the solder flow where I wanted it to? It worked! 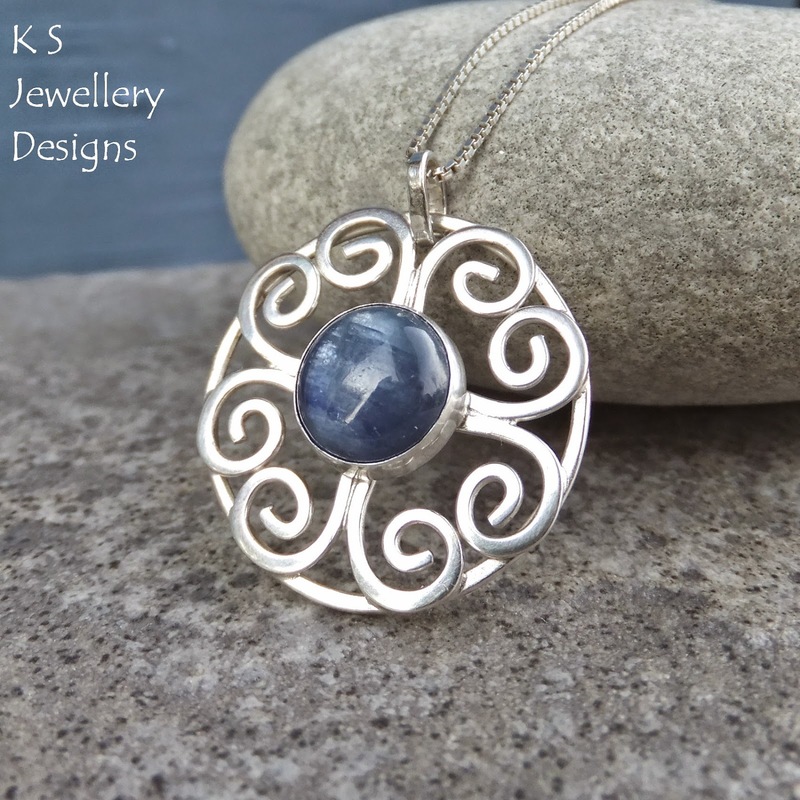 Now I am currently working a co-ordinating pendant using similar design principles. 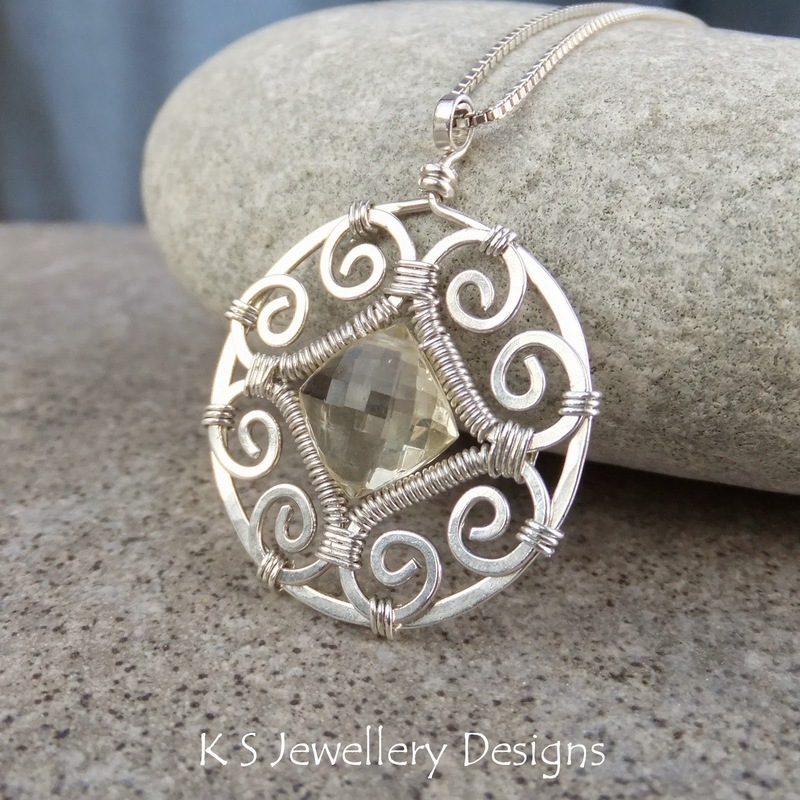 I think what makes my jewellery a little different from others is to do with my journey from wirework to metalwork techniques. 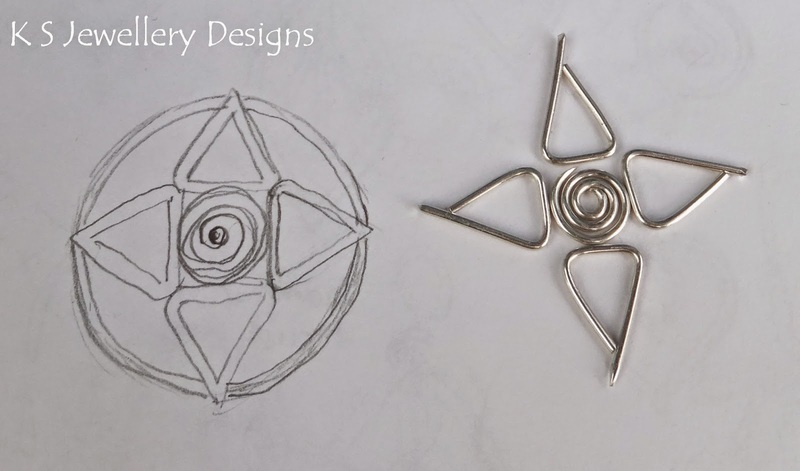 My wirework designs have strongly influenced my metalwork designs. I started out making simple beaded jewellery back in 2008 and then quickly moved onto to wirework. Wirework suited me as I have always said it is like ‘drawing with wire’. I felt I could recreate my drawings and doodles into jewellery by using wire instead of pencil. The challenge was always how to join and secure the design and how to embellish the jewellery pieces with gemstones. Through wirework, I discovered my love of hammering, especially flattening wire and adding texture. Last year, I attended an adult education course on silversmithing. I wanted to learn metalworking techniques but I also wanted to work out how I could adapt my wirework designs into metalwork designs. With metalwork, the challenge is still how to join and secure wire shapes but also how to control the heat of my torch so I don’t damage the wire. I’m still learning! Thank you for reading my blog post. 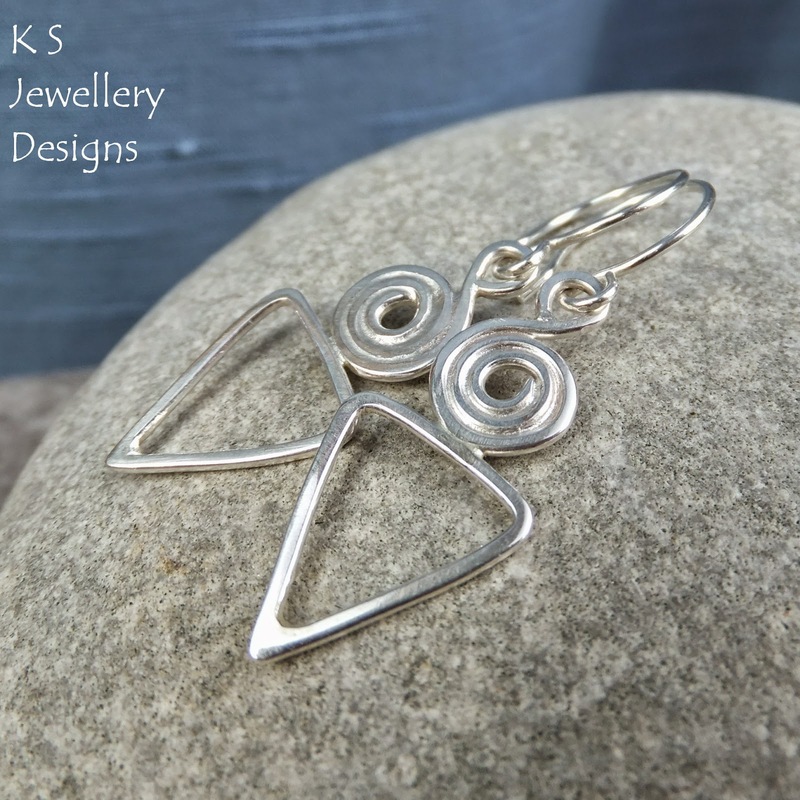 It has been very thought provoking for me to write it as I don’t often think ‘why’ when I am making my jewellery. It has been good to step back and try and explain my processes. The next Around the World Blog Hop post will come right across the world from me, a huge ‘hop’ from UK to Australia. It will be from the very talented Emma from Little Cherry Hill. I am a big fan of her jewellery. She has an excellent eye for design and cleverly combines texture and colour within her pieces. I recommend you take a look!